Jay started volunteering at Douglas County Libraries (DCL) in 2007. He has physical limitations that make everyday life challenging. 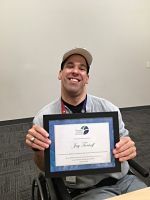 His mother or Neighbor Network have transported Jay to the Castle Rock branch one to two times a week for 11 years so he can give back to the community. Jay’s stamina and resolve to make volunteering a top priority is admirable. He has processed hundreds of thousands of books for DCL during his tenure, making many of them ready for the used bookstore to end up in patrons’ home libraries. Jay and his mom recently moved to a new home; his smile and fervor for life will be greatly missed. Thank you Jay!